Samsung Galaxy S10+ review | What Hi-Fi? 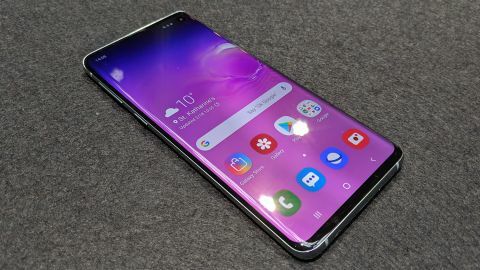 The 10th anniversary of the Samsung Galaxy range has been marked with the launch of not one, but three, new Samsung Galaxy S10 phones. The Galaxy S10+ is the biggest, most powerful and the most expensive. It comes complete with a 6.4in screen, a new "Infinity-O" OLED display, HDR10+ video support, Dolby Atmos audio, an Ultrasonic Fingerprint sensor underneath the front of the screen, a triple rear camera lens, a hefty 4100 mAh battery, the option of a 1TB memory, a microSD card slot – and even a trusty 3.5mm headphone jack. The S10+ is joined by a Samsung Galaxy S10, with a smaller, 6.1in screen, smaller battery and one less camera lens, but otherwise similar spec to the S10+, and the compact Galaxy S10e, which has a 5.8in screen and a lower spec and feature count. So, we’re dealing with the top-of-the-pops Galaxy S10+ here, but much of this review could equally apply to the S10, too. Smartphone manufacturers have largely settled on an optimum design – slim, black rectangles with minimal bezels – and it can be hard for the average punter to pick one from another in a line-up. Samsung has done its best to distinguish its phones from others on the market by offering a selection of colour options, albeit only on the rear of each unit. The S10+ comes in the standard Prism White, Prism Black and Prism Green, as well as special Ceramic Black and Ceramic White options, which are only available on the S10+. What is of note here, is the ‘hole punch’ design, which refers to the space allotted to the two camera lenses at the top right of the screen. The screen wraps around the hole made for these lenses in a similar way to the iPhone notch. And much like on the iPhone, or even Google’s Pixel 3, you soon forget it’s there. If you don’t, there’s an option to hide it by adding a black bar at the top of the display. The screen is an upsize on the 6.2in screen of last year’s S9+. It’s an Edge AMOLED (OLED) display, which rolls over the side to maximise real estate. With the phone measuring only 7.9mm in depth, it’s slimmer than its predecessor, and a little lighter too. If you can feel that we'll be surprised, but most importantly it feels slim, light and manageable. To a point. Even if you have huge trowel-hands, you’ll do well to reach the top of the screen comfortably, a fact the Galaxy interface doesn’t always seem to remember. Opening a folder of three apps, for example, the S10+ positions them at the top of the display, instead of keeping them at the bottom of the screen until you add more apps. If you want to make the screen momentarily more manageable, say you only have one hand free, a diagonal swipe from one corner will shrink the usable screen into ‘one-handed mode’, which is a neat feature. It's increasingly difficult for any phone to have the wow! factor and, while we have few complaints here, the new Galaxy S10 phones don’t really scream £1000. Compared to the Google Pixel 3 XL however, the S10+ feels a little more premium; slimmer, smarter and with those eye-catching edges. Either way, when it comes to parting you from your cash and justifying that price, it's all about what's inside. Samsung has done its level best to deliver headline-grabbing features pretty much everywhere. The screen, under the screen, the speakers, the camera, the battery, the memory... everything is buffed to top-tier levels of performance, on paper. So, where to begin? Well, the S10+ (and the S10) are the first phones to feature HDR10+-certified screens for ultimate 4K HDR picture performance. This means the potential to display video in a whole new level thanks to the all-important addition of dynamic metadata. This essentially translates to frame-by-frame attention to picture detail, as with competing format Dolby Vision. On a TV we're smitten with HDR, but how much difference this really makes on a 6.1in screen is debatable. One thing’s for sure, the screen looks superb. Samsung has become one of the first to move the fingerprint sensor underneath the display. Previously this has been below the screen, wasting precious real estate, or on the back. Samsung calls this ‘Ultrasonic Fingerprint’, which certainly sounds cool, and is supposedly harder to hack, too. In use, it just about delivers but we do find it a fraction slower than rival devices. The placement on the screen also requires a little more thought, or indeed a glance at the screen. It’s not immediately obvious whether the phone is up or down, so knowing where to press sometimes takes a fraction longer, too. It feels clever when it works and certainly gives you more screen, but it remains to be seen whether this is ultimately the best placement. Samsung is already releasing updates to the biometric scanner so it should only get better. Inside the phone, we see a not insignificant jump in memory size. The S10+ is available in 128GB and 512GB as standard across the S10 and S10+, but also with 1TB of storage in the case of the Ultimate Performance Edition. This is a crazy amount of storage, albeit it does also come with a £200/$300 premium. If that wasn’t enough, all three have microSD card slots, too. So you won’t run out of space. There’s also a 4100 mAh battery, giving the S10+ the edge even over the latest Galaxy Note 9. Last year's Galaxy S9, with its 3000 mAh battery, has also been left in the shade. And if you're wondering what to do with all that juice, you could always share it. Samsung's Wireless PowerShare allows you to share your phone's battery with any other wireless charging device, simply by placing the two devices close together. The new Galaxy phones are IP68 water resistant, too. That battery is a real bonus. A full day’s use is well within this phone’s reach and thanks to fast-charging, a quick top-up is easily applied if necessary, the S10+ only needing a couple of hours to get up to full juice. Samsung's One UI interface is much improved compared to the early days of bloatware overdose, but there are still some Samsung apps here that most people would rather do without. You can customise this handset to your heart’s content, while those happy to use the phone as it comes should be happy enough with the intuitive operation. One such customisation involves the Bixby button. Samsung’s voice assistant isn’t a patch on Google Assistant, so the dedicated button is something of an annoyance. Thanks in part to Qualcomm’s latest Snapdragon 855 processor chip, the Galaxy S10+ is brilliantly fast with no lag when flicking between apps or moving around the screen. Swipe movements are instinctive, only with occasional wobbles, such as having to swipe up to bring the apps menu on to screen and then right to access more. Google’s Pixel phones are the obvious comparison and it’s a real toss-up. We’d probably plump for the marginally cleaner and simpler interface on Pixel, backed by the knowledge those Pixel phones will get the latest Android updates sooner, too. But the speed in use here is a clear step up. The Galaxy S10 and S10+ have a triple rear camera and a dual front camera for an impressive five lenses (the S10e has four) – a 12MP regular lens, 12MP optically-zoomed telephoto lens, and a new 16MP ultra-wide lens, plus a dual-pixel 10MP camera on the front. As is customary with top tier phones, it comes with a range of camera modes, including Panorama, Pro and Live Focus. Artificial Intelligence means you can opt for the 'intelligent camera' scene optimiser or shot suggestions. Super Steady Video promises to make shooting video even easier, too. Samsung also says it's analysing thousands of photos to help it learn and in turn advise you as you take shots. All these lenses and features may appear a gimmick, but the S10+ still delivers good pictures. More is more when it comes to smartphone camera technology and Samsung delivers an inordinate amount of trickery. Should you want to get involved with your phone’s camera settings, you can really go to town here, but it’s also simple to skip between various ready-made modes for different types of basic photo. The main camera takes excellent images and shoots great video. Pictures are vivid and sharp, with only some of the secondary lenses delivering slightly softer images, while video is smooth. We think the Pixel still pips it for absolute realism and certainly in low-level light conditions, but this is another example of just how good phones have become at taking pictures. All three phones have an AMOLED aka OLED display; Samsung's latest Infinity-O Display, no less, in a 19:9 aspect ratio. The S10+ sports the Edge design, with the screen curving around the frame to eliminate any bezel. We have mixed feelings about that – at times, we find ourselves accidentally touching the screen lower down the phone as we reach for something at the top, the rolled-off edges making it slightly easier to accidentally activate the lower screen. You can turn off elements of the edge design, such as being able to swipe shortcuts in from the side but you can’t negate the design completely. It’s an eye-catching design, but almost too svelte and shiny for its own slippery good. The screen is a Wide Quad HD+ Dynamic AMOLED (WQHD+) at 3040 x 1440 resolution. You can shoot and watch HDR10+ video on the Galaxy S10, and Samsung name-checked Amazon Video in its launch as a source for 4K HDR10+ content. The phone promises 1200 nits peak brightness and also highlights the minimal blue light. In fact, there’s a ‘blue light filter’ option to keep this to a minimum. We were big fans of the Galaxy S9+ screen and the S10+ continues the excellent work. You have the option of Natural or Vivid when it comes to colour modes, with Natural dialling down the colours a touch and aiming for a more realistic representation, most noticeable with skin tones. With both modes edges are sharp, there’s impressive detail and good, solid black levels. Our class-leader, the iPhone XS Max, manages to be just a little more realistic, skies that just-right blue and green grass never appearing too lurid. There is a little more insight on the iPhone, but the Galaxy S10+ undoubtedly delivers good video, not least when fed 4K or HDR content. A slight bluish tint to whites is noticeable in comparative testing, especially in Vivid mode, but in isolation doesn’t bother us. Even if you’re not watching video, regular use is simply improved thanks to that razor sharp, colourful screen. Text pops from the screen that little bit more than last year’s flagship Android phones. Did we mention the Galaxy S10 phones have a headphone jack? It's clear from the reaction to handsets that have opted for USB-C or Lightning instead, that many still prefer to have the option of a standard 3.5mm jack. This means you can use existing wired headphones without an adapter, and have the option to charge and listen at the same time. The phone comes bundled with AKG earphones, which sound a little harsh and thin, so we’d opt for something better. There is also the option of Samsung’s new Galaxy Buds, but we’re not overly impressed with those either. Listening to CD-quality or hi-res files on Tidal, the Galaxy S10+ continues where its predecessor left off, delivering music with a surprising amount of scale and space. It is reasonably dynamic and detailed, and certainly strikes a pleasant sonic balance with a variety of our reference earphones whether listening with a wired or wireless connection. We were big fans of the S9 as a music player and the S10 has kept up the good work. On the iPhone, there’s a little more subtlety and music sounds more dynamic, with the bass on the Galaxy S10+ sounding slightly over-bearing by comparison. But as Android phones go, this flagship Samsung Galaxy will be hard to beat. The handset has AKG-tuned speakers that go loud but sound lightweight, plus support for Dolby Atmos, though we’re not convinced a smartphone is really the right device to be talking about Atmos. The Galaxy S10 has upped the ante when it comes to design, features and price. Thankfully, we can add performance to that list, too. Anything more than an incremental step is becoming increasingly hard to take when it comes to the annual smartphone updates but the eye-catching edge design, the big battery and super-fast processor, and that beautifully sharp screen, all give us reason to recommend the Galaxy S10+. It’s not perfect – the biometric sensor, edge design and that Bixby button all need some fine-tuning – but if you’re in the market for a flagship Android phone with a slim but big-screen design, and value audio and video quality, this really should be at the top of your wishlist.